Most of us picture a fixed rooftop installation when we think of solar panels – but did you know that there are solar panels that don’t sit still as they soak up the sun? Some photovoltaic systems are connected to something called a solar tracker, which powers ground-mounted solar panels to slowly change position so that they continuously face the sun. Solar trackers can use a number of methods and mechanics to function, but all of them are meant to do one thing: increase energy output by moving solar panels so that they receive as much direct sunlight as possible. Some manufacturers boast that their trackers can increase energy production as much as a 45% over a fixed roof system. Stationary mounts – the traditional fixed-to-your-roof installations – only have the perfect angle at certain times of day, so they aren’t able to take full advantage of the sun’s rays. Fixed systems might be less efficient than ones mounted to solar trackers, but each type of installation has upsides and downsides. It depends on the project, the customer, and the location. Not sure if one is right for you? Let’s learn more so you can decide for yourself. Who are solar trackers for? Solar trackers can be placed pretty much anywhere there’s solid ground and an unobstructed view of the sky, and can be installed for residential, commercial, or utility-scale projects. If you have enough space in your yard for solar panels, adding a tracker is an option. However, residential customers usually opt for fixed, roof-mounted solar panels instead of ground-mounted panels connected to a solar tracker – and there are a couple of reasons why. First, homeowners shopping for a solar system to install on their property typically prefer the subtlety and sleekness of rooftop panels – they usually don’t want to look out their window and see a huge solar panel setup in their yard. Solar trackers also require a certain amount of open space on someone’s property, which excludes customers with smaller yards. The second issue is related to cost: photovoltaic systems with solar trackers are more expensive to install and maintain. They require a lot more preparation and labor when it comes to the installation, and the mechanics of the tracker mean that maintenance is needed more often than rooftop systems. Because solar trackers boost output, a lot of savings can be generated during the lifetime of the photovoltaic system. Despite this, the higher upfront costs and complicated installation make solar trackers impractical for most residential buyers – making the majority of us opt for simpler rooftop installations. Solar trackers are, however, much more popular when it comes large, utility-scale projects. The higher price tag is less of an issue for a large utility company, and their massive solar plants already use ground-mounted panels. Also, due to the sheer size of these installations, utilities are able to enjoy a much lower cost per watt, allowing solar trackers to be more cost-effective. For homeowners out there who have enough space to install a ground-mounted system with a solar tracker, and are interested in maximizing their solar energy output, let’s explore more about solar trackers and how they work. Regardless of whether a solar tracker is installed on a residential property or as part of a larger project, there are two types: single-axis trackers and dual-axis trackers. Single-axis solar trackers, as you probably have guessed, operate on just one axis (just like the bar that connects two wheels in a car). 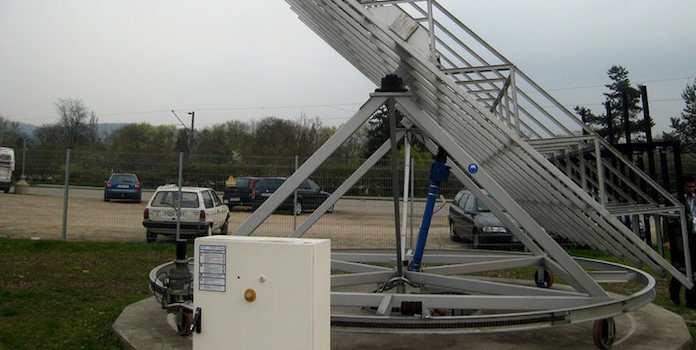 This type of solar tracker, because of its lone axis, can only move back and forth in one direction – for example, east and west to follow the sun, or just tilted to get the best stationary angle. 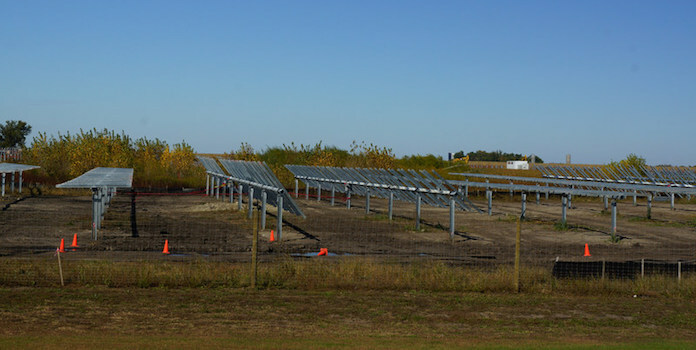 Dual-axis solar trackers, in comparison, work on two axes to move solar panels in two directions. Because it is not limited to just one direction, solar panels with dual-axis solar trackers are always facing the sun as directly as possible. They both tilt and rotate, generating the maximum solar output. So now we know about the differences between the two main types of solar trackers, but how do these things work? They do move, after all – so how do they know where the sun is located in the sky throughout the day? Motors: Many trackers are motor-driven, which are sometimes called “active” trackers. Motor and gear trains are responsible for guiding the solar panels toward the direction of the sun. The motors need to be quite powerful too because they are holding both the heavy weight of the photovoltaic system while also counteracting wind and snow. 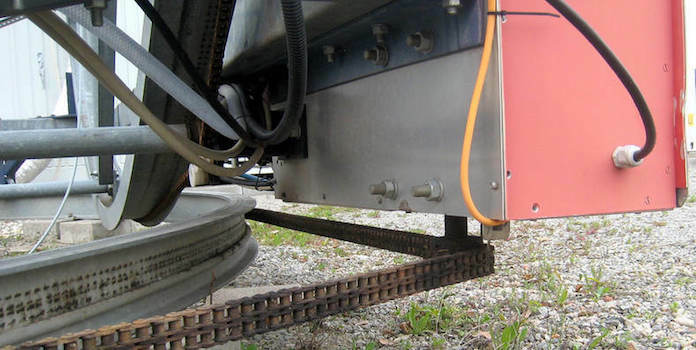 Liquid/Gas: Sometimes called “passive” solar trackers, these types of systems are able to shift the position of panels by using compressed gas fluid. Liquid inside of large tubes vaporizes as the sun heats it throughout the day, shifting gas through tubes to the other side of the photovoltaic system. The movement of gas and liquid slowly changes the weight of one side of the panels, so it can effectively direct the system toward the sun without using any power or machinery. Chronological: This type of tracker works with the movement of the Earth. Chronological solar trackers use a basic rotation mechanism to rotate non-stop at the same speed as our planet – but in the reverse direction. 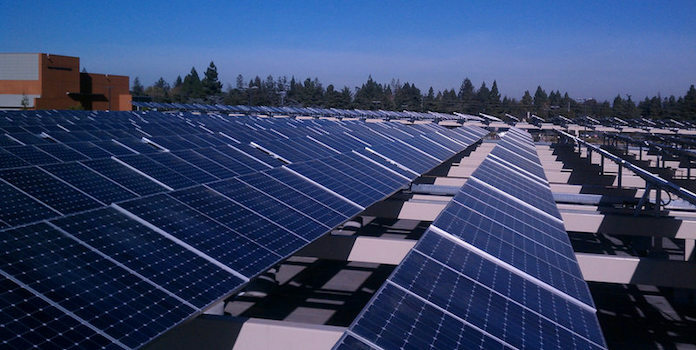 Output: Compared to stationary photovoltaic systems, solar trackers generate more energy thanks to the direct sun rays. Manufacturer claims vary, but at least one study showed between a 20-30% increase in energy production. Customization: Job sites can vary greatly, and solar consumers are located in different climates and geographies. There are many different types of trackers, and this variety helps installers customize systems to best fit customers’ needs. Size: Solar trackers produce more energy output in about the same amount of space necessary for a fixed-tilt system – making the best use of square footage. Pricing: Solar trackers add expense to a solar install. Standard panels are getting cheaper to produce, and trackers – with the cost of the added parts, the additional install time, and even the preparation involved in making the ground level so the tracker can work – can add unwanted expense to a system designed to save money. 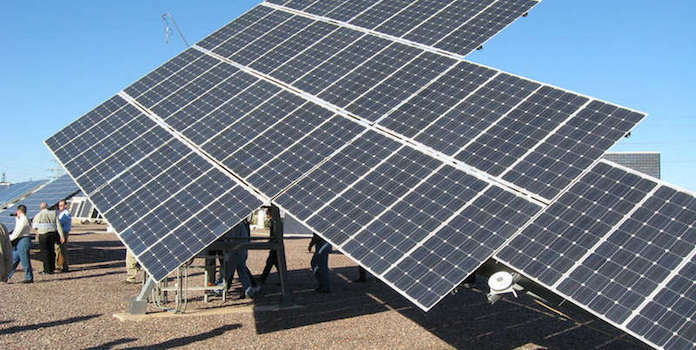 Maintenance: Compared to solar panels that sit still, there is typically more maintenance needed to keep solar trackers operating successfully. They do have moving parts and need to weather harsh outdoor conditions in many cases. Installation: Solar trackers are complex to install – and it varies depending on climate and location. Tracking systems require an expert to install, further increasing the cost of setting one up. On top of that, more site preparation is typically involved for things like additional grading or trenching for new wiring. Warranty: Compared to a fixed-solar system, which usually comes with a 25-year power performance guarantee, systems with solar trackers typically are backed for just 5 to 10 years. This adds to the burden of repair and replacement over the life of the solar system. On the whole, solar trackers can make a photovoltaic system considerably more efficient – for both big and small installation sites. Solar tracking systems are custom-installed based on the specifics of the particular site – and allow the panels to get as much direct sunlight as possible throughout the day. They are used much more in large-scale installations, thanks to their elevated price, continuous upkeep, and because they need to be mounted on the ground instead of on a roof. While it’s uncommon for homeowners to use them as well, they can still be a great choice for anyone who wants to maximize their solar output. 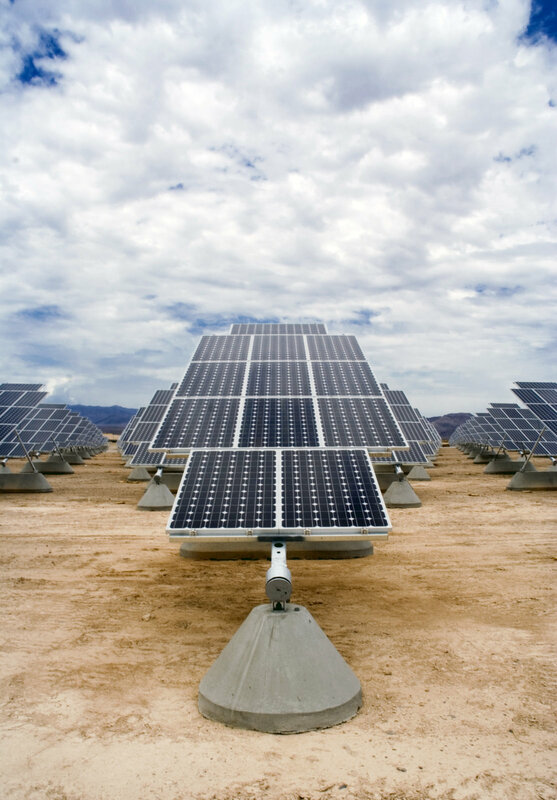 Whether or not a solar tracker is right for your solar needs is really a case-by-case matter. Make sure you consider all the factors mentioned above before deciding to add a tracker to your solar panel system. As another great option, you can also consider the Smartflower, a compact photovoltaic system suited for residential use, which also tracks the sun.